Um, yum. Those are about the only coherent words I can put together thinking about this meal. While I won’t go so far as to say these are authentic Philly chicken cheesesteaks (is that even how they are termed in Philly? ), they are a delicious take on that type of recipe and are so, so easy thanks to the slow cooker. I know the weather is warming up and you might not be inclined to pull out your slow cooker now that the cold, winter months are over, but I find that I actually use my slow cooker just as much in the summer as I do in the winter because it doesn’t heat up my house like using the oven or stovetop can. So if you don’t already, I’m thinking you should definitely get on board with that philosophy too so I can keep sharing summer slow cooker recipes! 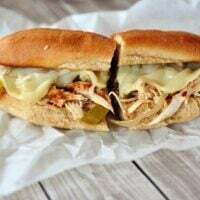 This recipe couldn’t be more simple – green peppers, onions, and chicken are layered in the slow cooker with a delicious, flavorful seasoning blend and cooked until the chicken and veggies are tender. 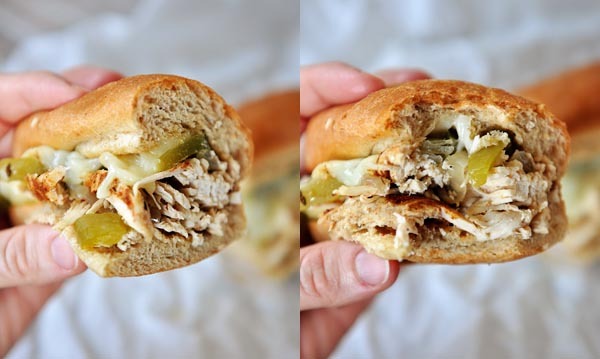 Stuffed onto a toasted bun with melted provolone cheese and you have one killer sandwich. A perfect recipe for serving company (it could be easily doubled or tripled in a larger slow cooker) or just for a busy weeknight when you can throw it in the slow cooker in advance, this has quickly become a family favorite. While you could certainly use storebought hoagie buns, when time permits, I like to make up a double or triple batch of these fluffy whole wheat dinner rolls and shape them into hoagie buns keeping them in the freezer for easy access. I’m a huge sandwich-for-dinner fan and this recipe only solidified that little fact. 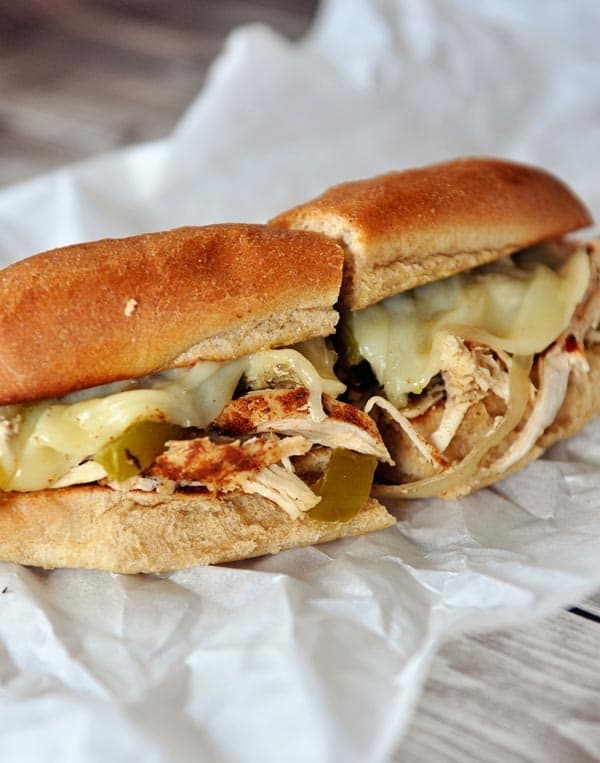 Soft, fresh bread loaded with tender chicken, peppers and onions, and smothered in creamy, melted Provolone? Like I said earlier: um, yum. Whole wheat hoagie buns (I use this Whole Wheat Dinner Roll recipe) but shape the rolls into longer hoagie buns. Lightly grease a 5-quart (or similar sized) slow cooker insert with nonstick cooking spray. In a small bowl, combine the paprika, pepper, salt, garlic powder, coriander, red pepper flakes and thyme. Place the green peppers and onions in the bottom of the slow cooker. Sprinkle 1 teaspoon of the seasoning mixture over the top. Toss the chicken with the rest of the seasoning mixture. Layer the chicken on the top of the green peppers and onions. Pour the chicken broth inside around the edges of the crockpot. Cook on low for 5-7 hours until the chicken is tender (over cooking the chicken may make it a bit dry so only cook it until the chicken is cooked through and tender). Remove the chicken from the slow cooker and shred into pieces. Set aside. Using a slotted spoon, remove the peppers and onions to a plate. Pour out all the liquid into a bowl or liquid measure. Place the chicken, peppers and onions back in the slow cooker and toss. Pour in enough liquid to keep the chicken moist (but not soggy) - about 1/4 cup to start and add as needed. Keep the slow cooker on warm or low until ready to serve. Toast the buns under the oven broiler. 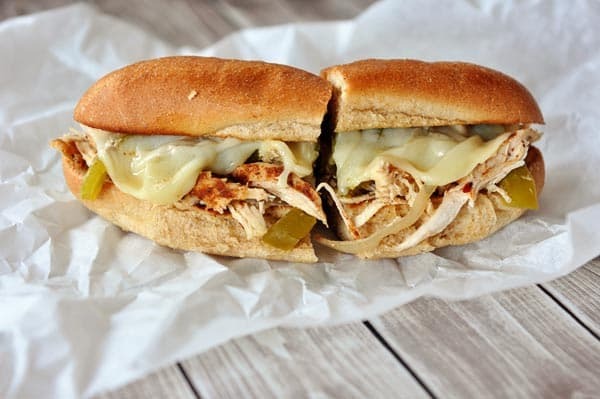 Place chicken and peppers on each half of a bun and top with Provolone cheese. Broil until the cheese is melted and slightly bubbly. Serve warm. If using frozen chicken breasts, use the longer length of cooking time (about 6-7 hours) and only use about 1/4 cup chicken broth. Also, instead of tossing the frozen chicken breasts with the seasoning mixture, just sprinkle the seasoning mixture over the top after they have been placed in the slow cooker. This has become a family favorite, a meal that all 4 of us love, which is rare:) I make it at least twice a month, but my husband requests it weekly. I use yellow and red peppers. You could just leave them out, I suppose – maybe add more onions? How long do you think it would take to cook in the Instant Pot? It sounds delicious! Probably 8-12 minutes depending on the thickness of the chicken. Would the liquid ratio be the same in the instant pot? Thanks! You’d probably want to add 1 cup total broth, just to make sure the pressure cooker comes to pressure and is safe. We had the missionaries over tonight and I served these. It was our first time trying them and everyone really liked them. I will be printing the recipe out and saving it in my cookbook. Thanks! I used a little over 2lbs of frozen chicken and it was done it about 4 hours. My crockpot cooks super fast. If I double the recipe how long should I cook for? If your slow cooker is large, you shouldn’t have to adjust the cooking time. I just watched your roll shaping video! For the hoagie rolls do you use 2 oz of dough like you do with hot dog buns, or do you use a little more? Thanks! Hi Mel! We are planning some freezer meals before baby #3 arrives, so of course we went to your blog. Your recipes are tried and true around here and my husband and I talk about you at dinner like you are part of the family. 🙂 I found this recipe in your freezable section and want to try it. How exactly do we go about making this into a freezer meal? Sorry for not having the details listed in the recipe! You could do it one of two ways, either make it and freeze it for quick reheating and serving or combine all the prepped (raw) ingredients in a freezer bag, freeze, then pop in he slow cooker frozen (add an hour or two to the cooking time) or thaw and cook as directed. Good luck! First time trying these, had a half hour so no slow cooker but I had thawed chicken tenders, made the seasoning mix,divided it, tossed about 2/3 seasoning with chicken and the rest with sliced onion and red and yellow peppers (they are sweeter) cooked the chicken in one skillet and sort of fajita- style cooked the pepper and onions. Served in ciabatta rolls. 25 minutes and delicious. Thank you. I think it might just be green peppers in the slow cooker – I’ve noticed the same thing a time or two but it isn’t consistent so that’s just a guess. Just had these for lunch. Cooked on high for 2 hrs, adding veggies (onions, peppers, and mushrooms, which I had tossed separately in the seasoning) in after first hr. Made the sandwiches, piled on cheese, wrapped in foil and put into warm oven (200-250 deg) to melt cheese and steam up bread. Came out perfectly. 2.5 lbs made 6ish sandwiches. Thank you for sharing! I made this on the stove top sliced the chicken tossed with the seasoning then pan seared, It was great! The seasonings are spot on and make for a delicious meal. This looks delicious but I’m concerned that a half cup or quarter cup of broth isn’t enough liquid for cooking the chicken for so long. Is it enough liquid? I make the recipe as written and it turns out great but if you would like to add more liquid, you could certainly experiment! Good morning! wanting to make this for dinner but I’m a bit gunshy of chicken crock pot recipes as of late. Made a Honey Garlic glazed chicken in the crock pot the other day and it didn’t glaze at all as there was a about a cup or more of liquid in it (I didn’t add any at all). The recipe photos showed no liquid but the chicken cooked with a nice glaze. I was VERY disappointed. So my question is, should I be guarded on what brand of chicken I use (that doesn’t have injected liquid like Tyson or retained liquid like Pilgrims) for this so I don’t end up with a liquidy mess? Your sandwich looks to have had very little liquid in the meat. I just want to make sure I don’t have another ‘pinterest fail’ . Thank you for advice! Hi Sara – I know what you mean. Most slow cooker recipes are going to end up with liquid since slow cookers don’t cook it off like other methods of cooking. This recipe definitely has liquid in the slow cooker, but I scoop out the peppers and chicken (after shredding) and try to leave as much liquid behind as possible. Using frozen chicken breasts also will make for a bit more liquid leftover, too. This meal is in our regular rotation now – as quite a few of your recipes are! They always end up feeling miraculous, because they without fail are ones that all six members of my family give thumbs up. Awesome crock pot recipe. I like that you mention in the directions to only cook the chicken breasts until done and not until they are mushy pulp. I hate that! 4.5 hours on low was perfect. I used whole wheat hoagie buns from the grocery store and I made your moms calico baked beans. It was perfect. Thanks! Do you think this could be made with frozen onions and peppers. We had these last night and they were delicious! The prep work was really quick and simple. These will definitely be in our regular rotation. Thanks for another winner! Thanks for the recipe! I made them yesterday. We all enjoyed them. Mild enough for the kids. My husband and I put banana peppers on ours. MMmm. thanks! I’m a Philly girl and although this is very far from the traditional Philly cheesesteaks it is by far one of the best recipes I’ve tried! The first time I made this I served it on potato hambuger rolls and it was DELICIOUS. I made it again on Monday and served it with brown rice. Again heavenly. Today I had some leftover chicken and tossed it in my homemade chicken noodle soup. It took chicken noodle soup to another level. YUM YUM YUM! Thanks so much Mel. This will be on heavy rotation for dinners! I made these for my husband and 3-year-old daughter and myself tonight and they were a hit! Thanks for another winner Mel! Maybe someone has already said this — FYI for smaller portion: I used two large frozen chicken breasts (like the kind Costco sells in the big bag) and it only took 4 1/2 hours cooking time on low. Very tender. Thanks for the recipe. Could this be made into a freezer meal? If so how would you go about doing it? Brittany – I haven’t tried it as a freezer meal but I imagine it would work fine. Good luck if you try it! This was a hit! And the leftovers made some dang tasty quesadillas. Thanks for another good one Mel! Yummy and easy. Highly recommend broiling the bread. Shred the meat lightly, as mixing in the veggies will shred it more. My house smelled heavenly all day. Delicious, Mel! I love a good slow cooker meal and this did not disappoint. Thanks for sharing! Made this last night and we loved it, so simple but so flavorful. Will definitely be making these again and again. Thank you. Made for a cookout today! So easy and yet flavorful and delicious! You probably know that Philly cheesesteaks are made with steak. But that doesn’t make this idea any less appealing. These look great! I’m a big fan of food that can go straight into the crock pot while still frozen. It’s such a time saver! I bought a bunch of chicken tenders on sale today, do you think I could use those in this recipe? Or would they overcook? Marci – I think there’s a good chance they would work out ok but I’d cut down the cooking time by an hour or so (if not more) – you really only want to cook it until the chicken is just done and really tender. Hi Joan – the slow cookers I’ve had have been in my life for over 10 years so I’m afraid I don’t have a great current recommendation but the ones I have are the Rival brand (I have a 4/5 quart and a larger, oval 7/8 quart) and they’ve held up great over the years! I set my slow cooker outside on a table so I don’t heat up the house at all. Trying this tomorrow. Looks good to me! I’ve got some boneless chicken breasts in the freezer just waiting for inspiration. I usually use chicken bone in, so this will be different. I don’t use my crockpot as much in the winter, I’d rather use the stove and generate heat. But it is a blessing in the summer because it doesn’t heat things up. My crock pot is my best friend in the summer so keep these recipes coming. This looks amazing! We love your Italian Beef sandwiches, and this will be great to add to the dinner rotation. Thanks! This is perfect for summer. You don’t even have to bother with the barbecue, which I don’t have this year anyway. Sandwich and salad and you are good—-hot or cold. I’m a philly girl and these may not be “traditional” but they look delish..actually, I’m sure they are because you have never failed me ! I use your pizza dough recipe to make a buffalo chicken Stromboli and it is always better than any pizza shop. You rock my socks Mel. Thanks, Gigi – you are too sweet (and that buffalo chicken stromboli sounds divine!). Mel these look awesome!! Yum. Yum. Yumm. I love a good sandwhich. I love easy dinners!! I have three small minions under age 5 so easy and yummy are my two fav words when it comes to dinner making. thank you!! I’ll be making these tonight! Breaking out the slow cooker right now! Loving this recipe! Keep the summer-y slow cooker meals coming! This looks amazing! Oh, a couple of friends and I talk about you like we know you because we cook from your blog all the time. Weird? Maybe 🙂 A huge compliment? For SURE! Thanks, Becky – that made me smile! I wish I lived somewhere near humanity and could actually meet you guys someday! Another great recipe! Thank you, I will be making these this weekend. This looks so delicious, especially with your homemade rolls. One summer a few years ago, it was so hot here in Maryland and I didn’t tuen my oven on for the entire summer! I used my slow cooker (most of your recipes!) and made lots of salads. Slow cooker recipes are perfect when the mercury soars! Looks wonderful! Do you discard the onion or use the pepper and onion mixture? Hi Cindy, I put the peppers and onions back in with the chicken. Girl, I need new slow cooker recipes in the worst way. This is perfect for Summer — LOVE!! Looks delish! I always love a big, overstuffed sandwich like this. 🙂 I’ll have to check out that whole wheat dinner roll recipe, too. Um, yum. Thanks to you, Mel, my freezer is stocked full over the hot summer months when we want to be “out playing” instead of me in cooking. One of our very favorite freezer stocked sandwiches is your Philly Cheesesteak Calzone. Everyone including company loves them not to mention your Italian Beef. Thank you for continually making my life so much easier with this crock pot recipe and all the others that keeps my family looking so forward to the dinner table or trip to the freezer! These look delicious!! I live in Philly, and although I would be hesitant to love any other cheesesteak or roast pork w broccoli rabe, I bet I will love these!!! Making them tomorrow, as I already have the flank steak marinating!